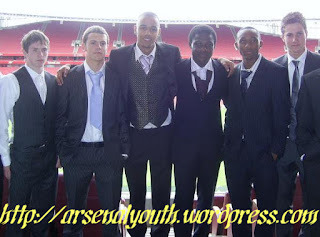 As i have written in the beginning i would be writing about our favourite arsenal players.First article was about arshavin and now a youngster.Our club is famed for its youth academy and the latest to enter the first team is Emmanual Frimpong. 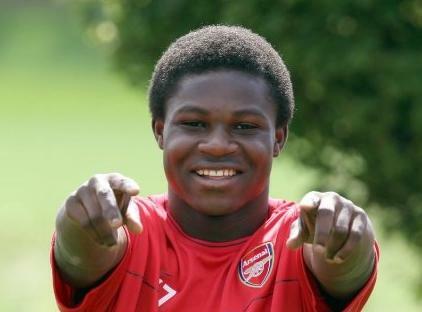 Emmanuel Yaw Frimpong is his full name.He was born in kumasi,ghana and moved to tottenham at the young age.Arsenal signed him at the age of 8.And according to the research he scored his first goal against coventry club. (sorry if iam wrong).The dynamic man came through the ranks after ten years of hardworking and remember it is not easy and only a few can do it. 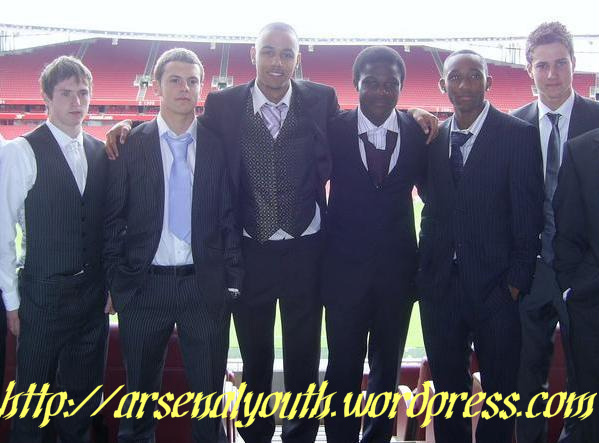 The lad was given the scholarship(a on pics,thanks to arsenal youth) after he impressed the coaches with improved performances.Then he won the double fa cup youth cup and premier league academy in the year 2008/09.Next year too, he was a member of youth team which won the fa youth cup.Every talanted youngster gets his chance and frimpong got it.Wenger selected him in the pre-season team of 2010.And in the emirate cup he was unleashed and he started both of the games.Lots of appreciation was won from the pundits as well as the fans.But injury struck him and he lost the chance to break into the first team along with his friend wilshere. The boss was very much pleased with his attributes especially his engine.Frimpong in my honest opinion never rested on his laurels and continued to work harder.The reason was obvious, fight for a place and also he loved the club deeply.Another interesting point to note is that he formed a formidable partnership with wilshere at the heart of midfield at his younger days.This will obviously help the club in the future. The year 2011 came,and frimpong broke into the first team.First match ,against liverpool he had a good game until the red card.Another game in which he really excelled was against manchester city.In that game against the billion dollar team he controlled the midfield.He also got another start against olimpiakos. Now looking at his game he is a defensive midfielder .His engine never stops and he has physical power to out muscle opponents.Tackling is good but only experience will teach him the correct time to execute it.The dynamic midfielder has a never say die attitude .Positioning and man marking has to be improved .Even though he had a good game against city,he should have done much better when they counter attacked for the last goal.But experience is teacher and with many games under his belt he would be a glowing star for arsenal.Only disappointing game he played according to me,is his last game .But he will overcome that and will be ready to pounce on any opportunities he gets. Let me explain guys,another reason i want him to be a great player.Looking back at our club, we have lost many players (good or bad) just for money.Samir nasri is the latest to go.What i like in Emmanuel Yaw Frimpong is that he LOVES ARSENAL DEEP FROM HIS HEART.He is a player who has lot of passion for our dear club.This could be understood from his deed,words and action for the last one year. And another noting point is that even when he had the opportunity to play for england(which has more chance to win trophies than ghana) he rejected it and decided to play for his own country Ghana.This is quite remarkable.This underlines his dedication for his homeland and also the fact that he does what he feels in his heart .. So guys lets hope he turns out to be another gem uncovered by arsene wenger.With games under his belt i would be expecting him to frimpong his opponents.What i think he needs now is lot of games which he will get if he goes out for a loan.Lets wish him best of luck. p.s has been out for a week with a lot of project and xmas celebrations.sorry for that.And after watching yesterdays game am frustrated to write about it.